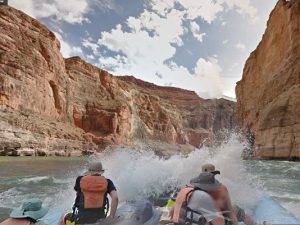 Google has been expanding its Street View service for Maps into everywhere that it can, and now, that includes the Colorado River as well. In order to get the shots of the Grand Canyon and other locations on the River, Google attached its cameras to rafts and rode down the water. After working on the project and collecting images from 286 (of 1,450) miles of the River, Google has released the images on Maps. A partnership with American Rivers made it possible for Google to collect the massive amount of images and since American Rivers is an environmental group, having more shots of beautiful places won’t hurt their cause. Google worked on the Colorado River for quite some time after starting in August. Not only did Google use cameras to collect 360-degree photos as seen from the river itself but Street View teams were also employed to hike five trails on the River in order to see areas that would have otherwise remained hidden from site. Prior to the latest photo release, Google had made images of the Grand Canyon available on Maps Street View. Outside of the Grand Canyon, Google also visited many other scenic areas along the nearly 300 miles of the Colorado River that it explored. American Rivers recently announced that the Colorado River is the “most endangered” river in the United States, so by working with Google on an eight-day trip, they were able to bring attention to the area and show people why it cannot be lost. This is not the first time that the Street View team has hoped off of land and onto the water. Google also released pictures of Venice and took photos on the many canals that are present there. Summary: Google has released Street View images from 286 miles of the Colorado River. The shots provide new ways to see the Grand Canyon. Google partnered with American Rivers for the project. American Rivers says that the Colorado River is the most endangered river in the US.